I became aware of the name Sacha Guitry when Criterion released an Eclipse set of four of his films in 2010 – although I didn’t actually see any of those films at the time. I had a vague impression that the writer-director-actor specialized in witty trifles most of which were filmed versions of his many successful stage plays. I’m not really sure where that impression actually originated, but because of it I felt no particular compulsion to seek out his work. However, Criterion’s new release of Guitry’s La poison (1951) did sound sufficiently intriguing and once again I’m faced with the personal discovery of a fascinating “unknown” filmmaker. La poison is indeed light and witty – on the surface. But my first reaction to this initial exposure was an unexpected sense of disorientation. This very tightly constructed comedy of manners is much darker and more unsettling than I was prepared for. Beneath that light and witty surface is a startling cynicism which suffuses the comedy with discomfort. With no prior experience of Guitry’s work, I was frequently puzzled about how to “read” the film. This began right at the start. La poison opens with Guitry sitting in front of Michel Simon and reading a long paean to the actor’s art and person, which threatens to become almost mawkish in its effusiveness. From here, Guitry moves from set to set and backstage at the studio, introducing and joking with all the members of the cast and crew. This opening “credit” sequence runs about six minutes and produced, in me at least, a degree of impatience: it felt as if the filmmaker was working very hard to convince me of his love and respect for his collaborators, but the scale of this effort began to feel self-inflating rather than self-effacing. What effect was Guitry trying to provoke in his audience with all of this sunny bonhomie? Well, one effect is to infuse the opening scenes of the story proper with an airy lightness. 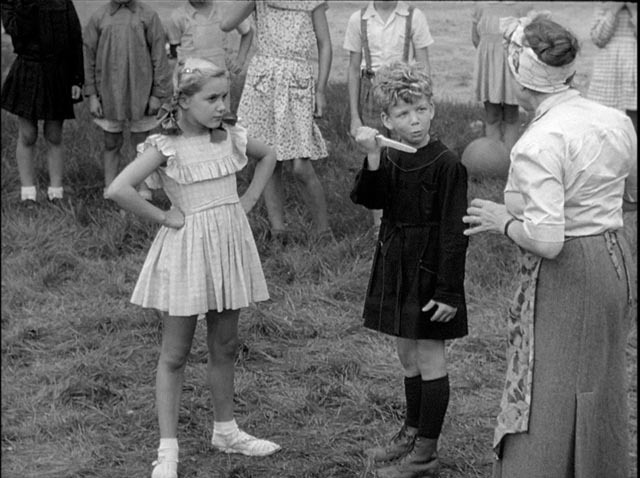 By foregrounding the artifice of filmmaking – the usually diagetically concealed game of make-believe – the audience initially watches the actors as actors, rather than suspending disbelief and viewing them as characters in their own imaginative world. (In this, our relationship to the actors here seems closer to the one we would normally possess at a stage performance rather than in a film.) In the early scene in which Michel Simon as the peasant Paul Louis Victor Braconnier stops by for a chat with the village priest, we watch him as Simon playing Braconnier – and enjoy the sight of him relishing the role. This is one of the lightest and most charming performances Simon ever gave … which in itself disguises for a while the darkness underlying it. Braconnier complains to the priest (Jean Duvaleix) that life with his wife of thirty years has become intolerable and he would like to be rid of her. When the priest points out that Braconnier himself is no longer the man he was when he married and that his judgment of Madame Braconnier is thus unfair, the peasant brushes the objection aside. What matters is his own dissatisfaction and revulsion for what his wife has become. After all, doesn’t a woman have a responsibility to retain her appeal? This introduces the thread of misogyny which becomes more pronounced as the story unfolds. The film reinforces that thread immediately with the introduction of Mme. Braconnier (Germaine Reuver), who is portrayed as an alcoholic monster, a bitter soul whom we first meet visiting the local pharmacist (Georges Bever) to buy a pound of rat poison. Back at home, her intentions are made clear as she looks for a good place to hide the poison – she too is sick of this marriage and is contemplating relieving herself of her husband. 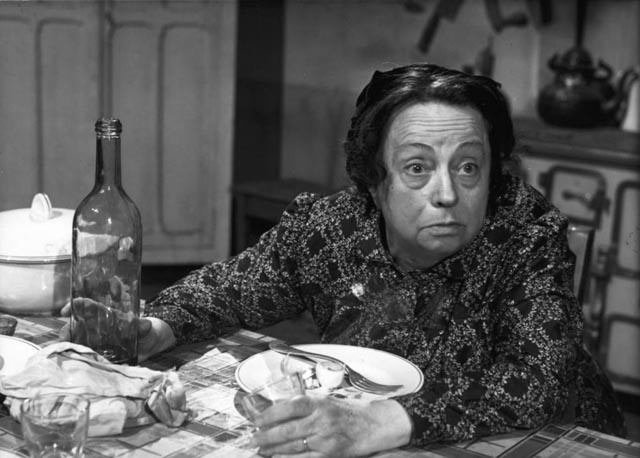 This mutual animosity would be off-puttingly unbalanced if not for Beuver’s wonderfully comic performance, which almost against the film’s wishes forces us to view Braconnier more critically although Guitry’s sympathy is obviously with him. While his wife’s intentions are obviously premeditated, Braconnier’s scheme is more ad hoc. Various events lead him to formulate a plan for the perfect murder. First there’s a radio drama overheard as they face each other across the kitchen table; a violent marital argument blasts out of the receiver, giving the neighbours a mistaken impression that this is Braconnier and his wife. 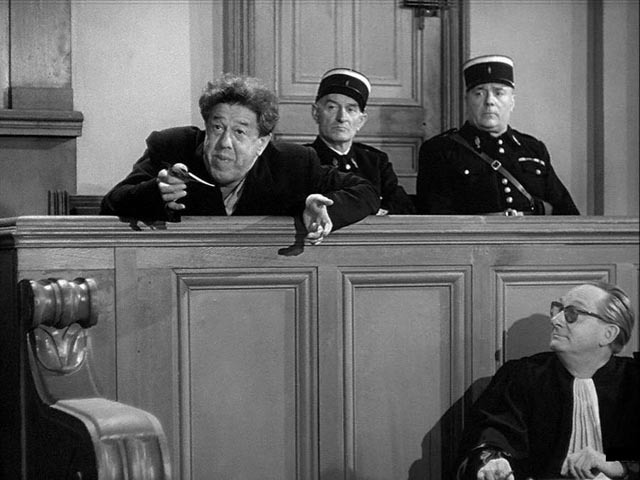 The radio plays an even more vital part in a subsequent scene when we hear an interview with renowned advocate Louis Aubanel (Jean Debucourt), who has just won his one-hundredth acquittal. This introduces the film’s major theme that the law is not about justice, but is rather a form of theatre in which the construction of narrative and the quality of performance takes precedence over the truth. 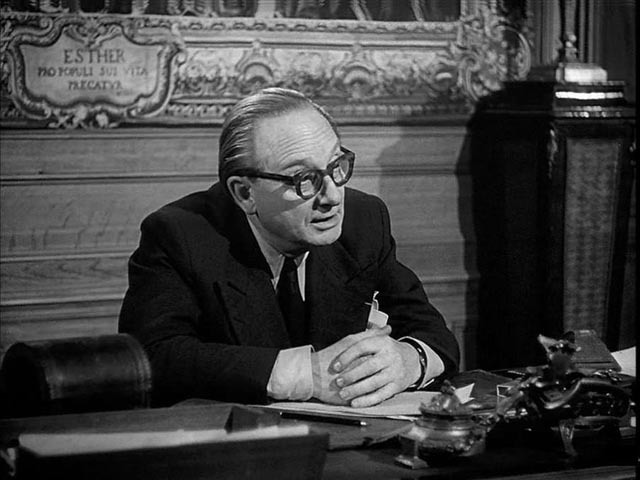 In perhaps the finest scene in the film, Braconnier travels to the city for an appointment with Aubanel; in the advocate’s office he “confesses” to having murdered his wife. Braconnier proves a wily schemer, using his peasant smarts to manipulate the arrogant lawyer. By hesitantly confessing to an as yet only imaginary crime, he draws out of Aubanel exactly how he should commit the murder in order to escape punishment – he learns what he should do, what weapon to use, what emotional registers to play and what he should say to the police in justification. Armed with this detailed knowledge, Braconnier goes home and, after staging another loud argument in which he accuses his wife of infidelity, he stabs her to death. What he doesn’t know – a fact which aids his plan – is that the glass of wine his wife has poured for him is laced with rat poison. When Aubanel realizes that the murder was actually committed after his meeting with Braconnier, he confronts the peasant in his prison cell, but Braconnier is completely unrepentant, pointing out that it would be easy for him to make public that the advocate had given him detailed instructions for committing the crime. Aubanel reluctantly takes his case. But it turns out that Braconnier hardly needs the lawyer’s help in the climactic trial; committing murder has filled the peasant with confidence and eloquence and he goes on the offensive in court, confronting the artificiality and inadequacy of the law; it doesn’t matter that he didn’t know his wife was trying to poison him – her intention retroactively justifies his killing her as self-defence. If she had succeeded, the law would have convicted and executed her, so how is it wrong for him to have dispatched her before she could commit her crime? Of course, this argument logically would have justified her killing him – in essence, seen objectively, his assertion that she would have inevitably been executed for killing him ought to condemn him, but he so confuses the court that the judges are defenceless against him. What matters after all is not logic and fact, but the power of performance – this is theatre and Braconnier completely dominates the scene. La poison is very funny, but its view of personal relationships and society itself is bitter. That a rather disagreeable man who murders his wife is received by his neighbours as a heroic figure at the end negates the very idea that this society has a moral dimension. 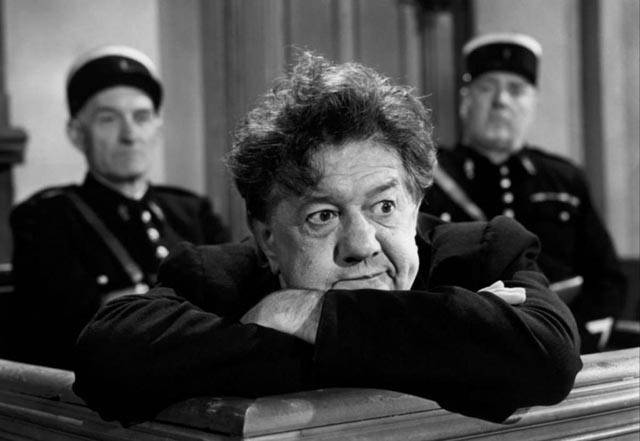 Superficially, the film bears some resemblance to the great Ealing comedies of murder – Alexander Mackendrick’s The Ladykillers (1955) and Robert Hamer’s Kind Hearts and Coronets (1949) – but those films ultimately never lose their sense of a social and moral order; Guitry’s seemingly lighthearted comedy skates on the surface of an abyss. 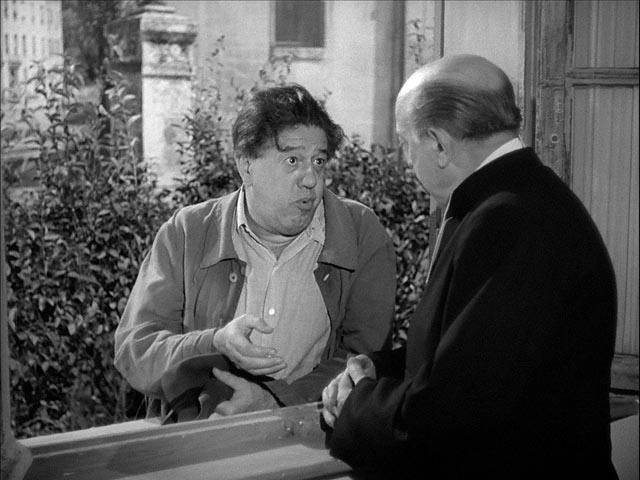 Perhaps it’s even closer to Chaplin’s comedy of murder, Monsieur Verdoux (1947), but La poison is more unsettling because it avoids Chaplin’s overt political argument; Guitry isn’t satirizing the inherent murderousness of bourgeois capitalism, but rather attacking the idea that there is some kind of impersonal moral glue which holds society together. This is a dark view of human relations for which there is no apparent political solution. This film is at once darker yet more superficially conventional that some of Guitry’s earlier work – after viewing La poison, I watched both The Story of a Cheat (1936) and The Pearls of the Crown (1937). There are some thematic continuities, particularly in the former whose title character, having learned early that dishonesty pays, proceeds to spend his life successfully avoiding honesty. Both of these films are more stylistically radical, constructed as pageants of brief evocative scenes held together by an extensive use of voiceover – in fact much of The Story of a Cheat plays as a silent film with narration taking the place of intertitles. Guitry’s work has a precision which is admirable, each moment carefully crafted and quickly moving on to the next. But in La poison he has scaled the action down (those earlier films span decades and centuries respectively), while expanding the scenes, dramatizing rather sketching each moment. The magnification of a single tightly focused story, seems to amplify the darkness and cynicism … it is a much more bitter film than those earlier works, something which has been attributed to his personal bitterness over his treatment after the war, which saw him prosecuted and briefly imprisoned for collaboration because he had continued to work during the Occupation (although not for a Nazi production company) and because he was an admirer of Petain. This personal experience – imprisoned without a clear charge and eventually released because the judge could not discover exactly what crime he was supposed to have committed – colours the film’s open contempt for the legal system. That he chose this particular vehicle, a story about a man murdering his wife, to convey that contempt suggests that he had other, more personal demons to exorcise. The hi-def transfer from a fine grain positive, with digital restoration by Eclair Laboratories, is luminous, with rich blacks, excellent contrast, and a film-like texture. The sound, restored from a 35mm optical track, is clear throughout. Criterion’s disk supports the feature with three useful and illuminating extras: an introduction by Olivier Assayas (16:17), a 2010 documentary about the collaboration between Guitry and Simon (1:01:02), and a 1965 episode of Cineastes de notre temps about Guitry (1:06:53). Together, these give an excellent overview of the filmmaker’s life and work, of his transition from a successful theatrical career to the cinema after the arrival of sound; of his popularity despite critical disdain for his “filmed plays”; and his embrace by the critics of Cahiers du cinema in the ‘50s, who found his work to be both stylistically radical and highly cinematic. He came to be viewed as one of the major influences on the nouvelle vague (that influence can be discerned in works such as Truffaut’s Shoot the Piano Player). There are echoes in Guitry’s work of those other masters of wit and observational comedy Rene Clair and Jean Renoir – although Guitry’s work seems to lack Renoir’s empathy. Renoir’s famous dictum that “everyone has their reasons” allows his work to embrace all characters, while Guitry takes sides (his treatment of Mme. Braconnier being a case in point). 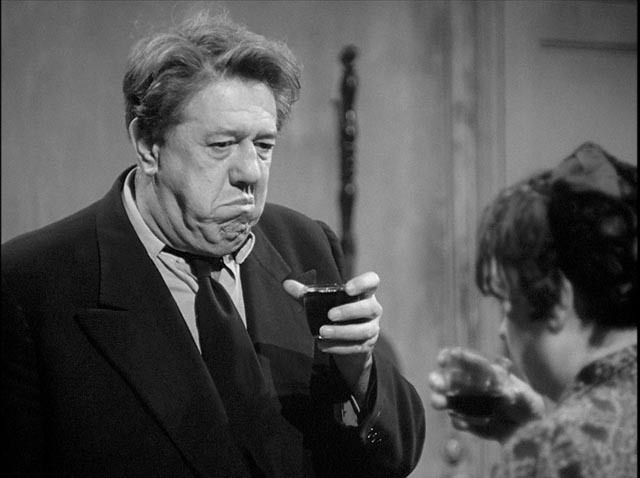 Considering his reputation among French critics and filmmakers, I’m not sure why Guitry hasn’t attained as prominent a position internationally as Clair and Renoir, but hopefully more of his work will see release in English-friendly editions. This release contains a slightly more substantial booklet than is usual for Criterion, with an informative essay by Ginette Vincendeau and an admiring tribute to Guitry by Francois Truffaut, originally written at the time of the filmmaker’s death in 1957 and updated in 1975. This entry was posted in Review and tagged Actors, Black comedy, Blu-Ray, Criterion, Directors, French Film. Bookmark the permalink.